The Alt or High Bergueda is a great region to visit and in which one can enjoy leisure activities at any time of the year. For nature enthusiasts there is the Cadi-Moixero Natural Park (the second largest of its kind in Catalonia), the mountain of Pedraforca and other protected nature parks that enable you to get close to nature. 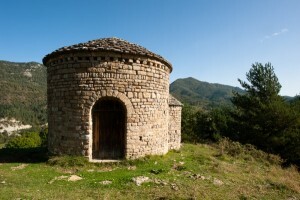 For those who prefer culture, the area has a great many historical treasures and there are museums to help you get to know about the development of Alt Bergueda, from its beginnings right up to our times: Sant Quirze de Pedret or the Mine Museum in Cercs are just two examples of the culture and heritage to be found here. The cuisine in Alt Bergueda includes typical mountain fare, complemented by the greatly appreciated mushrooms, nature permitting. Where exactly is High Bergueda? The Cadi-Moixero Nature Park is the second largest of its kind in Catalonia, covering an area of 41,342 hectares. It includes mountainous zones ranging from altitudes of 900 m to 2,468 m. The area has a varied geology and flora and fauna which are typical of Mediterranean, Alpine and Eurosiberian environments. There are over 230 species of birds, mammals, amphibians, reptiles and fish, as well as over 1,500 plants. Some of the animals worth mentioning are: the izard (the Pyrenean chamois, which can often be seen) and the black woodpecker, the symbol of the park. With regard to emblematic places, there are many to choose from. The nature park has vantage points and an extensive network of paths and tracks that enable visitors to enjoy spectacular landscapes and hidden nooks, and observe an exceptionally well-conserved wild natural environment. In 1982 this area was declared a Nature Spot of National Interest for the purpose of conserving its vegetation and unique beauty, whilst at the same time guaranteeing the rehabilitation of the open-cast coal mines. This massif is one of the most emblematic nature areas of Catalonia and is noted for its wealth of biological and geological diversity. It is a mountain which rises from 1,300 m (4,265 ft) to 2,497 m (8,192 ft) at its highest peak on a base with an extension of just three kilometres. The mountainside is the home of wallcreepers, red-billed and yellow-billed choughs, and it is not difficult to spot izards close up. The Valley of Gresolet opens out at the base of Pedraforca, with its impressive forests of beeches, firs, Scots pine and dwarf mountain pine which are of great interest to botany enthusiasts. Its strange shape has given rise to many legends and tales. This is one of the few examples of natural systems in the Llobregat Basin that are in good environmental condition. Here we find water-based and river-bank vegetation, as well as different types of algae. These fluvial habitats have been declared a Partial Nature Reserve in order to protect the otters found here. Along the stream it is possible to find several pools and beach areas, in which you can swim at certain times of the year. Along some stretches there are trout fishing reserves. The river is flanked from north to south by a forest path, which makes it easy to discover the hidden delights of this zone. This area is on the border of Baix (low) and Alt (high) Bergueda. This mountain range is made up of a highly fractured relief structure, with narrow, deep valleys that have made it possible to preserve some hidden spots and the natural transitional systems that link the Pre-Pyrenees with the high plateaux of the regions of Central Catalonia. Here we find a landscape that is essentially forest, with a predominance of conifers and some holm-oak and oak groves. At the northern edge of this area we find the Baells Reservoir, which is suitable for a great variety of water activities. Covering a surface area of 635 hectares, this is the protected nature park that is closest to Berga, the capital of the Bergueda region. This area is made up of the Queralt and Serra dels Lladres mountain ranges, and its highest point is the peak of Campllong, 1,589 metres high (5,213 ft). It has been declared as an area of outstanding natural beauty due to its unique geological landscape of sheer rock walls. The predominant form of vegetation are pine forests comprising different varieties of Scots pine, depending on the location, interspersed with some oak groves; the mythological interest of these woodlands is also worth a mention. From the Sanctuary of Queralt and the Figuerrassa viewpoint, there are splendid views looking out over inland Catalonia: Montserrat, Montseny, Sant Llorenç del Munt, Cabrera, etc. This sierra has plenty of secret nooks and crannies. I love this limestone massif because is unique in that it contains a vast array of geological and biological diversity within a relatively small area. Here we can see the typical vegetation found on shaded and sunny slopes in the eastern Pre-Pyrenees, including holm-oak woods, oak, pine and beech groves, with boxtrees (quite rare in Alt Bergueda). It is possible to see flora and fauna which are of considerable interest, both due to their rarity and vulnerability, such as the Edelweiss and deer. Some of the specific places of interest in this area are: Roc de la Lluna, Joc de la Pilota, Roc del Catllaras, Roc de la Clusa, the Pla del Catllaras and Serra del Catllaras. We should mention the Xalet del Catllaras, inspired by Gaudi. It is is located in the south of Cadi mountain range and in the west and north of Ensija mountain range; consequently, it shares many of the features common to these mountain ranges. The highest point is Cap del Verd, 2,289 metres high (7,509 ft). It is unique in that it has a varied collection of animals from sub-Alpine zones and the levels immediately below these zones, at its borders; these are easy to spot as many of them pass through this area on their way to other protected areas. Its pastureland is used by herds of cattle and izards, who peacefully co-exist in the highest areas. Part of the massif forms part of the National Hunting Reserve of Cadi, which is managed by the Catalan Government and which is committed to the conservation of hunted species and their habitats. This area constitutes one of Catalonia’s southern boundaries of Alpine and sub-Alpine vegetation. Particularly noteworthy in the higher zones are the Alpine meadows with a great many Pyrenean species and the forests of dwarf mountain pine and rhododendrons. In the lower areas, pine forests predominate, though we can also find woods of woolly oaks with boxtrees and beeches in the shadier areas. The fauna here is very similar to that found in the Cadi-Moixero Nature Park, although not quite as rich. The highest peak in this area is Gallina Pelada (also known as Cap Llitzet), with an altitude of 2,307 metres (7,568 ft); this can be reached from either the south or north face of the range. The Delgado Ubeda refuge is located near the peak. The entire Ensija mountain range is a good place for trying some mountain walking, as there are gentle routes with different levels of difficulty, and amazing views can be enjoyed from the higher points along these routes. The little Alt Llobregat Tourist Railway links La Pobla de Lillet with the village of Castellar de n’Hug. On the 20 minute ride you’ll see some amazing sights, such as the Artigas Gardens, designed by Antoni Gaudi, and the Asland Cement Museum in the former cement factory. This museum is dedicated to the coal mining industry in Bergueda. It is located in the mining colony of Sant Corneli, which, following the model of the industrial colonies already established in Catalonia, was founded at the end of the nineteenth century to accommodate the people employed in the coal mines. Today it is one of the best preserved mining settlements in Spain. The museum is located in the mining colony of Sant Corneli. A community of monks of Sant Benet built their monastery here at the end of the ninth century. One century later, donations made it possible for the abbacy to construct a majestic three-nave church, following the tradition of the classic basilicas, and this was consecrated in the year 983. It is situated to the North of the village of Guardiola de Bergueda, in the Valley of Brocà, in a wonderful natural setting on a plateau on the eastern face of the Gisclareny mountain range. The monastery was built in the 9th Century; nowadays shows Romanesque signs, traced by the Latin cross plant, two out of three original apses and the rustic square-planted cloister. The rest of elements have undergone modifications. At its side lies rotonda de Sant Miquel, one of the best preserved Romanesque circular-planted churches. In the middle of the ninth century, the pre-Romanesque church became too small and the Augustine community from Frontanyà started to work on the construction of a new church and monastery. Unfortunately only the church has been preserved; this is an exceptional building from the first Catalan Romanesque period, both due to its imposing size and balanced structure. At the beginning of the fourteenth century, the Augustine community which founded the church and monastery entered a period of decline, and since 1592 the building has only served as a parish church. Sant Quirze de Pedret is a supreme work of pre-Romanesque architecture. The building was constructed between the ninth and tenth centuries with contributions from the Romanesque period. It contains the reproduction of important mural paintings from the tenth century (the Orant and the Knight) and twelfth century (the parable of the Prudent Virgins and the Simple Virgins). The bridge of Pedret is Gothic and is shaped like a donkey’s back; it dates back to the thirteenth century. The church was constructed between the eleventh and twelfth centuries and it was consecrated in 1167. It comprises a single nave, reinforced with a semicircular apse that preserves the typical decoration of the first Romanesque period, blind arcades and Lesene strips. A two-storey square bell tower rises up from the nave. Under the central window of the apse there is a line of herringbone stonework. The building was erected in the 12th Century over remains from the High Middle Ages. It contains mural paintings original from Linear Gothic and reproductions of Romanesque mural paintings of the 12th Century. 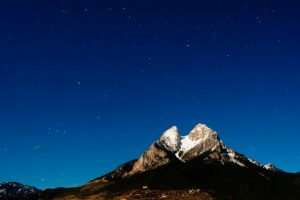 Undoubtedly the most popular peak is Pedraforca, because of its forked shape and because of the need to scramble to reach the summit, whichever route you choose. Pedraforca is next to the Cadi range but it is not considered part of it. Pedraforca is the best-known peak for those outside the region. Many clients who come to Catalonia want to climb it. The Cadi range belongs to the Cadi-Moixero natural park. The range’s highest peaks are Costa Cabirolera (2605m) and Puig de Vulturo (2653m), whose north faces are part of a very long cliff, the popular north face of the Cadi range. Usually these peaks are climbed from the south side, because the north side is very steep and dangerous in winter due to the chimneys full of snow. The view from these peaks is better than Pedraforca’s, allowing us to see all the mountains in la Cerdanya: Tosa Plana de Lles, Carlit, etc. However, another peak that is not as high but more beautiful is Comabona (2554m). It is also on the ridge of the range and not far from the Gosolans pass, used by Picasso in the early 20thcentury to go to Paris from Gosol. I recommend it for winter, because ascending it at that time of year is an amazing experience. Another peak I should mention in this range is la Tosa (2537m). La Tosa is not a beautiful peak at all, basically because there is a mountain hut near the summit and the ski lifts of La Molina ski resort arrive up at 2500m. However, the path we follow starting at Coll del Pal is very beautiful, following the up-and-down ridge throughout. The views from the summit are breath-taking. Finally, I will not leave the Moixero range without mentioning the Cap de la Boixassa (1825m). This peak is not much visited, but its shape and solitude have always attracted me. Views from Saldaguda peak: Ensija range on the left, Pedraforca in the middle and Cadi range on the right. I always lead clients to two peaks in this range: Serrat del Migdia (1077m) and Saldaguda (1168m). Serrat del Migdia is an excellent viewpoint to overlook the Catallaras range. To reach the summit you have to cross a pass where a rope helps you to keep your balance. Climbing the Saldaguda peak is an amazing hike for those who love scrambling. You reach the summit from the west and leave it to the east. The summit, marked with an iron cross, is very small. When you are having lunch there, an orange will roll away fast if it starts moving before you notice. From the summit you can see Pedraforca and the Cadi range. The peaks I love most in this range are Sobrepuny (1656m) and Roca del Joc (1615m). Sobrepuny faces south whereas from Roca del Joc the best views are to the north. From Sobrepuny I would highlight the beech-tree forests you cross before reaching the summit and the summit itself. There you enjoy a beautiful outlook over Catalonia because there is no other higher mountain between you and Barcelona. You see Montserrat, Montseny and Sant Llorenç de Munt natural parks. Roca del Joc is a crag on the north side of the Catllaràs range, but still far from La Pobla de Lillet (where you can see Gaudi’s gardens). Climbing Roca del Joc takes you just 20 minutes from the bottom, but part involves a scramble using iron pins stuck into the rock. Saldaguda summit is small, but Roca del Joc summit is even smaller – a summit of just a three square meters with a big iron cross. Two peaks stand out in this area: Cap del Verd (2282m) and Cap d’Urdet (2240m). Both are part of the ridge between the Bergueda and the Solsones (another Catalan Pyrenean region). 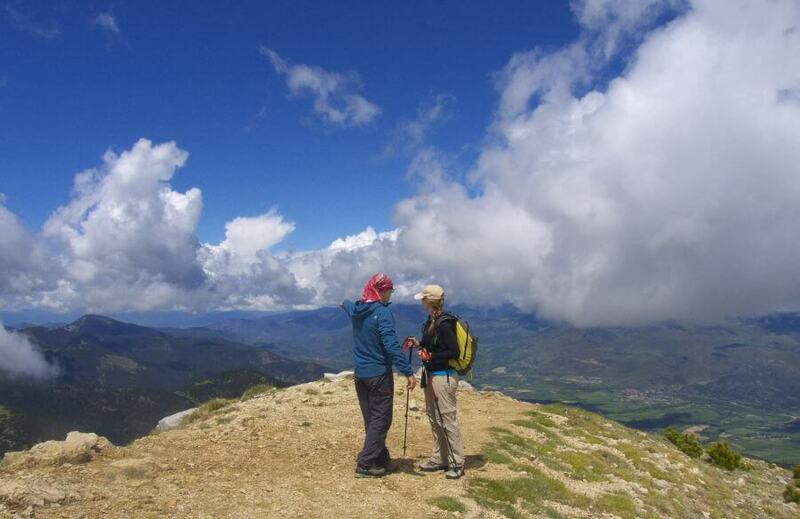 Both summits give fantastic view points of the Cadi range and Pedraforca. However, I recommend you ascend both summits from the Solsones, from the south. The landscape is wilder and you do not have to walk up boring tracks. Ensija range and Sobrepuny peak are the best view points to overlook Catalonia. Ensija range has four peaks which are linked by a gentle ridge. I would highlight two of them: Serrat Voltor (2279m) and Gallina Pelada (2317m). Serrat Voltor requires some scrambling to reach but is not difficult at all. From the summit, there are excellent views of the Catllaras range. Gallina Pelada summit is a larger area, easier to ascend, but has the best views of Pedraforca, something not to be missed. Please comment below on A Walkers Guide to the High Bergueda, Catalan Pyrenees. 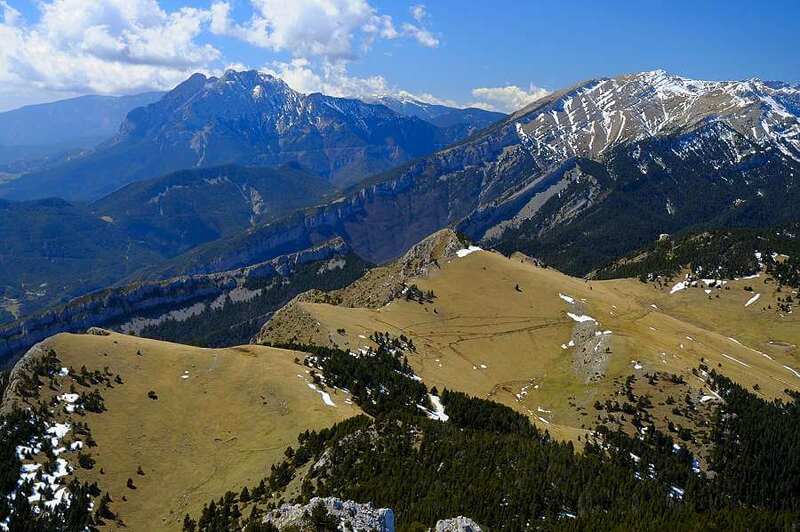 If you wish to travel to this part of the Pyrenees and see the most beautiful spots in the Bergueda – see what tours we have for you below or contact us here for any Pyrenees Tours questions you might have. Founder of TrekPyrenees and Mountain Guide, Miguel has a diploma in Computer Sciences and MBA. Passionate about mountains and about meeting and leading people, he loves photography, languages, Romanesque architecture and wine. There are many magnificent hidden spots in the Pyrenees and the other mountains of Catalonia that are hard to discover on your own. Miguel loves finding them and then showing them to visitors. GR 11 map – Trek the Pyrenees now!